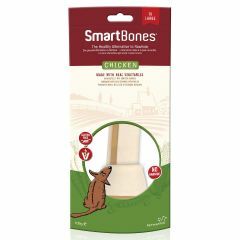 SmartBones Chicken Mini Sticks have all the benefits of a rawhide stick, without the rawhide and the health risks associated with it. Made with real chicken and other wholesome vegetables, these sticks will have your dog eating out of your hand. SmartBones Sweet Potato Bones have all the benefits of a rawhide chew, without the rawhide and the health risks associated with it. 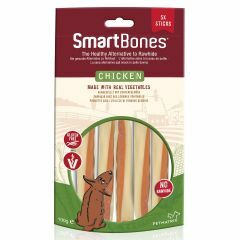 Made with real sweet potatoes, chicken and other wholesome vegetables, these bones will have your dog drooling! 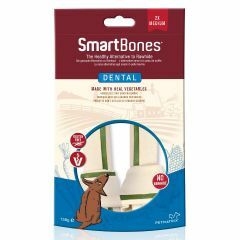 SmartBones Chicken Bones have all the benefits of a rawhide chews but without the rawhide! Made with real chicken and wholesome vegetables, these bones will taste delicious to your dog and come with none of the health risks associated with rawhide. 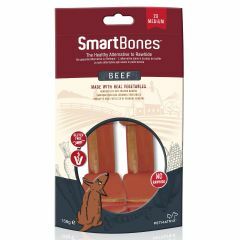 SmartBones Beef Bones have all the benefits of rawhide chews but without the rawhide! Made with real beef, chicken and wholesome vegetables, these bones will taste incredible to your dog and come with none of the health risks associated with rawhide.